Henry and Lynn Cohen met in their mid-40s, and neither realized that the other one had been boat-struck since elementary school. 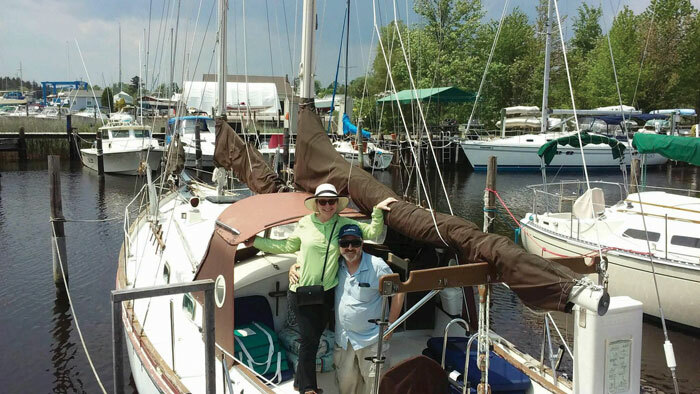 The couple spent three years reading and dreaming about sailboats before they bought their first one, a Catalina 27. Now they own their dream vessel, a Lazy Jack 32 schooner. They are self-taught, but had plenty of help from more experienced sailing friends. "We are living the dream with so much more to look forward to at this stage of life," says Henry. What sparked your interest in sailing? Lynn recalls, “In the beginning we sailed our Catalina in the mouth of the Chester River. Later, when we finally mustered the courage to take the boat out into the Bay, we realized that the Bay itself was usually easier to handle than our Chester River ‘comfort zone,’ with its challenging and confused winds and currents. “We initially thought sailing was for rich people, but we found that we were able to make it work on a fairly tight budget. It depends on your priorities. We tightened our belts wherever possible to achieve our dream,” says Lynn.